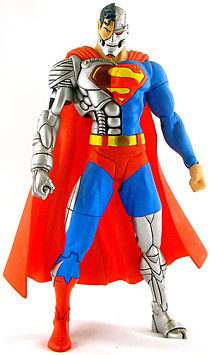 Both DC Direct and Mattel released figures of Cyborg Superman that were stupidly hard to find, leaving fans screwed. It took over five years for DC to come up with an excuse to release a new version of the character, but Mattel acted much faster, making us wait just a little more than one. This figure is the same as the one that was quote/unquote "released" as part of DCSH6 - you know, the one that never really showed up in stores, because no one wanted to buy Black Suit Superman, Kal-El Superman or any of the other pegwarmers? Yeah, that one. It's just been re-released in a two-pack with Mongul, exclusive to TRU stores, nominally as a part of the DC Universe line. Since DCSH and DCU Classics are pretty well interchangeable, Hank doesn't look out of place at all. 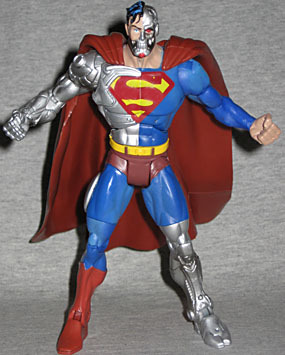 Most of his underlying sculpt is shared with DCSH2 Superman - but not the metallic half, of course. That's new. And it's done just as well as the rest, since it's straight from the Four Horsemen's... whatever the equivalent of a drawing table is for sculptors. Workbench. Something. There's lots of generic technic detailing on the "metal" parts (the visible parts, at least - Mattel saved money by leaving a lot blank), lots of plates, seams and layers, and it looks good on the figure. However, this is still the figure's weakest point. Why's that? 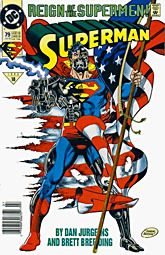 The idea of Cyborg Superman is that chunks of his body are missing, replaced with cybernetic pieces out of necessity. 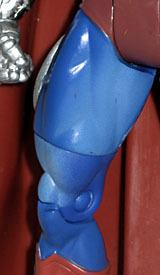 He was drawn (and, on the DCD figure, sculpted) with gaps in his anatomy, even going so far as to have a hole all the way through his bicep. The design should make 'borgy look like a torn-up Terminator, but because the Horsemen's work is all done on top of the existing body, that isn't the case. 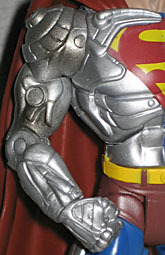 The metal should appear as if it's under the flesh, not above it; this guy looks like he's wearing fancy body armor. The head, however, fixes that. This sells the design all by itself. The quarter of his head that still has skin looks like the standard Superman figure's, while the rest is a silver skull. Again we get plenty of detail, but this time it's helped by large portions - in the mouth, mostly - being sunken far below the surface. The red dot in his chin probably shouldn't stick out so far, and the detail in his teeth is soft, but overall, this is a good presentation. And unlike some Cyborgs, this one has a nose and ear. One flaw with this specific figure (I've only seen this one right now, so I don't know if it's endemic, or I just got a bad one) is the paint. No, I'm not referring to the fact that his S-shield is red and yellow the whole way across, rather than turning dark as it nears the metal, as it did in the comics; the problem here is actually with the blue. There are light patches scattered about his body - the shoulder, beneath the elbow, on top of the knee and inside the thighs - that could be a clumsy attempt at painting highlights, or could be some sort of flaw with the production process. Definitely look it over before you buy. 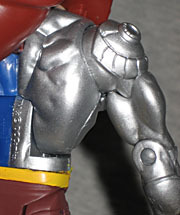 Mattel's Cyborg Superman isn't a flawless figure - far from it. He is, however, another fine addition to the DCSH/DCU ranks, and a pivotal character you can't really afford to be without. Just because there are some problems with the toy, it doesn't mean he's not worth buying: just that you need to know wht you're getting, and not over-spend. Honestly, I'm a bit surprised that Mattel didn't go for a Sinestro Corps repaint with this two-pack release, but maybe they're saving that for a future series.